One of my earliest childhood memories is ‘baking’ with my mum. She would fill lots of little cups and bowls with different ingredients and then stand me on a chair at the kitchen bench and let me go wild. I swear this early exposure to cooking is why I have always loved being in the kitchen. It might also be why I am such a messy cook. Cookies like these are a great thing to bake with toddlers and small children because they are so simple and virtually impossible to muck up. When I bake with Louie, I first prepare all of the ingredients by measuring them into cups, then get him to stand at the table with me and show him which ingredient to add to the bowl next. It's the most simple thing and yet it brings him so much joy! Sometimes he wants to eat the mixture or roll the dough into balls, other times he just wants to watch. Most of the time it gets messy, which I love, because that's what being a kid is all about. This is a recipe I originally shared in the Suku Home Mothers Day newsletter. It's loosely based on a recipe from my first cookbook – Vegan Goodness – but the addition of peanut butter makes it a kazillion times better and it has become such a staple in my home that I had to share it here on the ol' blog as well. Enjoy! Combine all of the wet ingredients and heat – either in a saucepan over a low heat, or in a microwave-proof vessel in the microwave - stirring frequently until everything is warm, melted and well combined. Pour the wet ingredients into a large mixing bowl. Add the dry ingredients one by one, stirring well after each addition and adding the chocolate last to ensure it doesn’t melt. 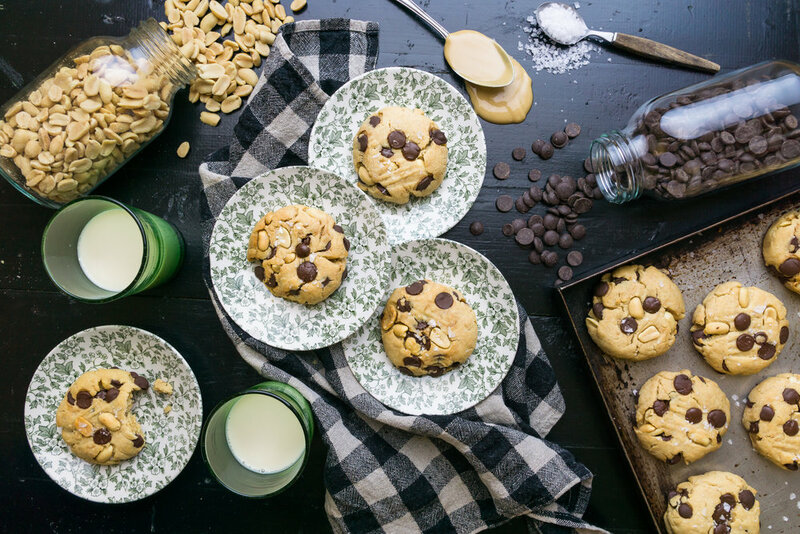 You may need to use your hands to fully incorporate all of the peanuts and chocolate chips. Roll the dough into 15 balls – about golf ball sized - and place them on your baking tray. Flatten with a fork and then sprinkle the tops with salt flakes and any additional chocolate buttons that are still in the bottom of the mixing bowl. Place in the hot oven for 10-15 minutes then remove and allow the cookies to cool on the baking tray. My mum always said you should remove cookies from the oven when you first smell them, as they will continue to cook on the hot tray once you remove them from the oven. This is what helps them to be crispy on the outside, and soft on the inside.